What is the difference between trainer mode and game mode? Trainer mode allows you to freely learn the notes on the fretboard at your own pace. Random notes within the number of frets of your choice are presented to you indefinitely. Statistics are kept so you can keep track of your accuracy. There are no time constraints, but you should aim for correctly identifying the notes as fast as possible. Game mode uses a similar interface, but presents you with challenges of increasing difficulty. 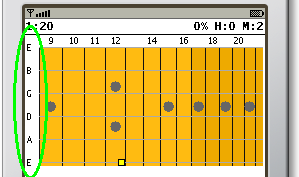 Levels vary by the number of frets among which notes are picked, the time allocated to reach the target of correct guesses, and whether helpers are present on the screen. The first, easiest levels will present you with notes from the first few frets, while the later, much more difficult levels will present you with notes from all over the fretboard, with no helpers and very little time for correct guesses. The goal is obviously to build up your skill so that you are finally able to breeze through these last levels. That's where the trainer mode comes in handy. How do I play the damn thing? 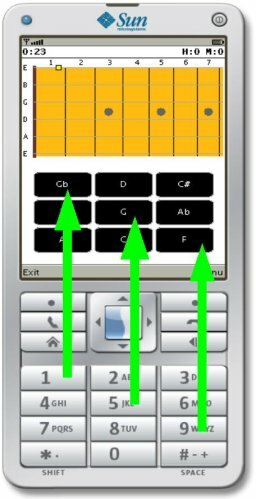 The buttons in the bottom half of the screen (underneath the fretboard) are organized in a way that mimics the digital keypad of most cell phones, i.e. the "1" key will activate the button in the top left corner, while the "9" key will activate the the button in the bottom right corner. If your device supports more advanced input methods, like a stylus or a touch screen, you should also be able to click directly on the buttons. Additionally, hitting the "0" key (or clicking on the fretboard) will sound the last note again in either mode. When tuning, this key will instead produce a sequence of all the tones of the tuning. Since version 1.0.7, you can also use the right and left arrow keys on your phone to scroll the fretboard, allowing you to look at the entire neck. How do I select notes on my BlackBerry? Nothing works! Your keypad needs to be switched to numeric mode to be able to select the notes on the display. On many BlackBerry devices, this is off by default. You may use the Alt key to switch your keyboard to the numeric keys and then use these to select the notes as shown on the display. How are points counted in game mode? Additionally, 5 points are awarded for each remaining second at the end of a level (time bonus). The faster you complete levels, the more points you make! What is the difference between letter notes and solfege syllables? This only affects how notes are displayed in the application. Letter notes are C, D, E, F, G, A and B, which correspond respectively to Do, Re, Mi, Fa, So, La and Ti syllables in English. Letter notes are enabled by default but you may switch them to solfege syllables if you wish, by changing the "Use letter notes?" option. Note that this option was introduced in version 1.0.10 of the software. Note that since solfege syllables take more space to display, depending on the size of the fonts and your screen, letter notes may still be displayed on the fretboard itself. What are the tuning notes for? Guitar Trainer provides an easy way to tune any of the supported instruments on the go with your cell phone! This mode allows you to produce tones corresponding to each of the open strings of the selected tuning. You can then manually tune the string by ear. While not quite as handy as a real chromatic tuner, this can be very useful considering the wide variety of alternate tunings and instruments supported by Guitar Trainer. Do you support left-handed instruments ? Absolutely! The fretboard display can be switched to either right-handed or left-handed necks, allowing you to learn the fretboard of the instrument you actually play. How many levels are there in game mode? There are currently 29 levels of increasing difficulty in game mode. After you reach a new level, you may play again any of the levels up to that one: the start level can be changed in the options. By default new games start at the last level you have reached. If you are aiming for the highest possible score, you may want to try to finish all levels in one straight session, because of the points accumulated during the previous levels. Quite frankly, you should be focused on the progress you are making at quickly identifying notes: finishing the last level of the game will be your badge of honor! Helpers refer to the various hints that are displayed around the fretboard, particularly the note names on the side, and the fret numbers at the top. They are very useful for beginners, but as you get better you should start using the trainer with the helpers turned off. Of course, when not at the nut, the first fret number will always be displayed. Note that the fret markers, which are typically present on guitars at the 3rd, 5th, 7th, 9th and 12th frets, are not considered as helpers. These are always displayed. Note that the helpers option only applies to training mode. In game mode, the easier levels will usually have helpers on. For the more difficult levels, they will be turned off regardless of the setting of the option. What's the difference between At fret and Open string for the helpers option? This determines what notes are displayed on the side of the fretboard when away from the nut. At fret (the default) will show the name of the notes immediately preceding the first fret being displayed. Open string, on the contrary, will always display the name of the notes at the nut, corresponding to the open strings. This is slightly more difficult than the default mode, since you can't simply count the steps from the first fret to determine the notes. What is the "frets" option referring to? 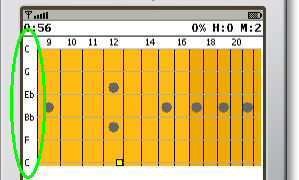 This is the number of frets (from the nut) over which notes are picked for practice in training mode. For example, for a value of 7, notes will only be picked at random within the first 7 frets. This setting is ignored in game mode.